Resident Evil makes its Vita debut with Revelations 2 – an ambitious port of a game we already saw on next gen and PC. We look and see how it fares in the transition. Resident Evil: Revelations 2 comes to the Vita a few months after it was released (in four episodes and later as a full package) for current and last gen consoles as well as Windows PCs. In other words, it’s not a brand new game and the benchmark for it has already been set on more powerful systems. Still, shouldn’t we just be happy that another relatively major title has finally found its way to the Vita? Resident Evil: Revelations 2 is, like its predecessor, a spinoff of the main Resident Evil series. The first Revelations took place between Resident Evil 4 and 5, while this one bridges that gap between games 5 and 6. The Revelations games also differ from the regular games by emphasizing survival and suspense over the action-packed sequences found in Resident Evil 4 through 6. What’s also interesting to note is that Revelations 2 is the last game Sony is publishing themselves for the Vita this year. While it’s not a big exclusive for the platform, it’s still nice to see a major franchise making its debut on the Vita. One of the first things people look at when a console titles appears on handhelds is how well it was ported. Handhelds are noticeably less powerful, and have other limitations in terms of controls as well. Since the game itself has been previously released and extensively reviewed, we’ll also focus on the quality of the port here. In terms of content, Frima Studios has done a wonderful job. A game that took up about 7 gigabyte of data on PS4 has made it onto the Vita in its entirety, and that’s no small feat. 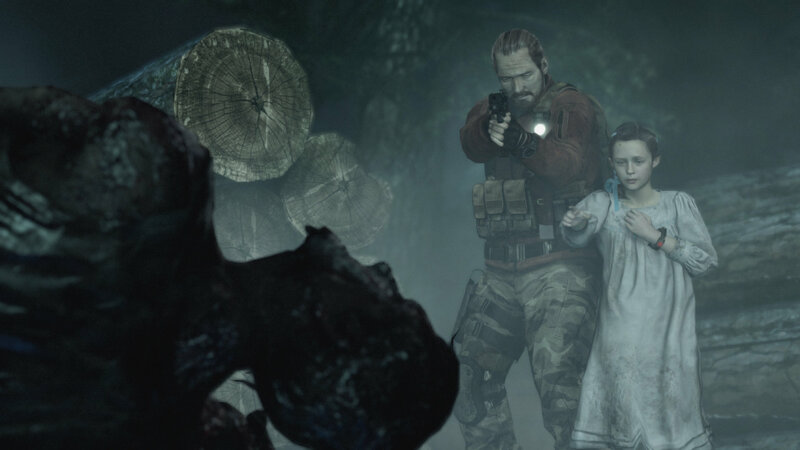 If you take into consideration that many of the LEGO games for Vita were redesigned for simpler gameplay, it’s commendable that Resident Evil: Revelations 2 has made the transition intact. This does come at a price though. While the install size isn’t nearly that of the PS4 version, the Vita version will still take a while to download and will take up a considerable chunk of your memory card – it’s a digital only title as well, so there’s no way around it. What’s also lost – which was to be expected – is a certain amount of detail and graphics fidelity. A handheld system simply isn’t capable of outputting the same level of quality when it comes to graphics, and corners have to be cut. This results in some of the backdrops and character models looking less than stellar, but it’s still a decent looking game. Perhaps not when compared to the likes of Uncharted or Killzone, but those are (unfortunately) the exceptions on the Vita, not the rule. Load times are another problem for this release, but it’s a common one for the Vita platform – especially in data-heavy games like this. It’s not all a matter of compromise though – some tweaks were made to the gameplay and controls that actually use the Vita’s strengths as well. The lack of controller buttons has been turned into a clever use of the touch screen, which works quite well. Some of the lesser-used options in the game, including healing, crouching and the use of flashlights, have been mapped to the corners of your touch-screen. This allows for easy access to these features without having to go through elaborate menu structures or button combos that break the flow of the game. 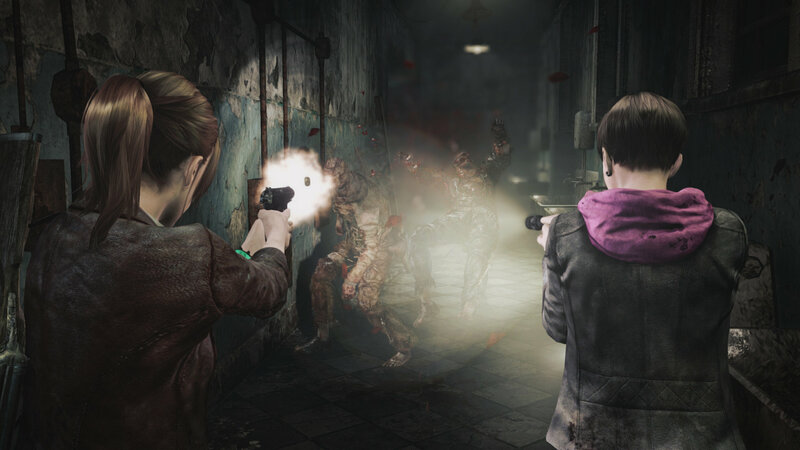 Resident Evil: Revelations 2 also features cooperative play, though it’s AI-controlled and you can take control of the other character when the situation demands it – usually when confronted with a puzzle. Raid mode also made it onto Vita – a game type where you get to play a variety of short mini-missions. They’re great for when you have limited time available, have shorter load times than the main missions, and suits the “on the move” type of player with its short mission length. What we’re left with, all things considered, is a competent and ambitious port of a console game. It’s not perfect and the Vita sometimes really struggles to process everything that’s being thrown at it, but if you can forget about the console versions for a second this is an excellent handheld version of Resident Evil. Sure – things could be a lot better if someone builds a Resident Evil game for the Vita from the ground up, but until then this is the best you’ll get.